1 Bedroom Loft, sleeps up 4, Ski in/out, close to all amenities at Blue. Newly renovated condo close to all amenities at Blue Mountain Resort in Collingwood available for short term rentals this season! This is a seasonal unit. Blue Mountain has a variety of activities in all seasons. The summer months are amazing here as the unit is only 3 minutes from Georgian Bay or 20 minutes from Wasaga Beach. The fall colours will blow your mind and you can't beat the sunsets all year round. This unit is located at the back of the resort and is very private. There are beautiful views up the mountain, and you can hear the Mountain Spring through your open window at night. Not all units offer such wonderful privacy and views. The condo is located on the shuttle route to the Village at Blue Mountain and is also conveniently located to many winter activities including skiing, snowboarding, tubing, snowshoeing (at the back door), cross country skiing, and all of the other activities offered at Blue Mountain. It also backs onto Craigleith Private Ski Club, with a short walk through the forest trail. This unit is ski in-ski out conditions permitting. Just ski across the bridge to the North Lift at Blue and ski back down right to your doorstep at Apres Ski time. You can buy your lift tickets right at the bottom of the North Lift. No need to find parking at the Village. The gourmet kitchen is fully equipped for your nights in or just for breakfasts. It boasts a convection oven and dishwasher, and full set of gourmet cooking tools. You also have a beautiful stream running right outside your door. This unit is very private, has two balconies, and looks up the mountain. There is free internet, bedding, and all linens. There is a pool available during the summer months and chairs are available on the deck. 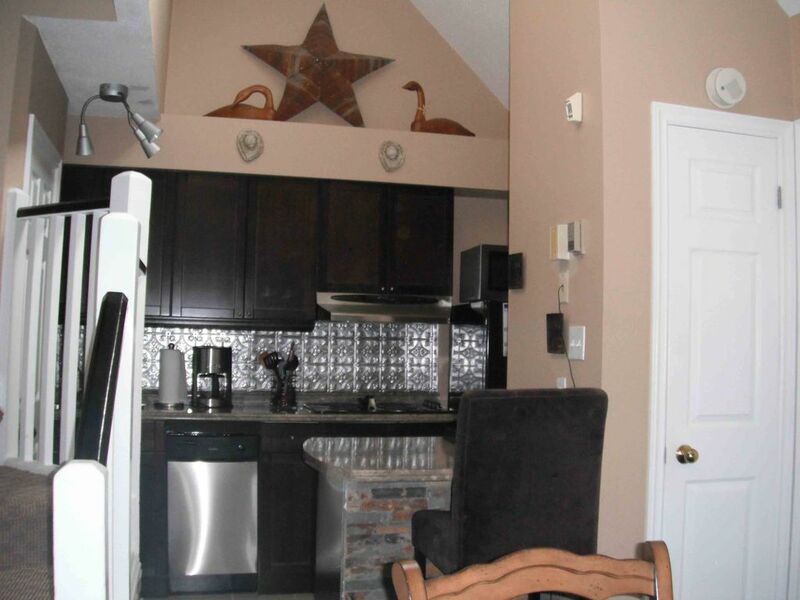 This condo is perfect for a small family or couple`s get away. It is a one bedroom loft with 2 full bathrooms and a pull out queen sized sofa bed. It sleeps 2 - 4 perfectly. It is not suitable for more than 4 people. The town of Collingwood is full of beautiful shops and gourmet restaurants, or you can take the free shuttle to the Village at Blue, and enjoy Apres Ski and gourmet restaurants. No need to drive! Just park and either shuttle or ski to the village. Lots of activities for the kids! This unit is owned and operated by our family. We also use it ourselves on a regular basis both summer and winter! We skiied Blue Mountain for many years, and just fell in love with the Collingwood area. There are so many things to see and do. It is a beautiful area in all seasons with something for every member of the family to enjoy. Collingwood and Georgian Bay are an amazing all season destination. The biggest ski resort in Ontario, Blue Mountain, is literally at the doorstep of this unit. The summer months are beautiful with so many activities for girls weekends, famility get aways or romantic weekends. Visit the scenic caves, hit the Coffin Ridge Winery, or spend the day shopping in downtown Collingwood. There are famous hiking trails and Blue Mountain offers amazing Mountain Biking trails with gondola lifts! Only 1.5 hours from Toronto and GTA. Once you've been you will always be back! Don't forget Elvis Festival...what a blast! Beautifully renovated bathrooms. One with full walk in shower with multiple jets, and one with shower and soaker tub. High end vanities, mirrors and teak-look tiling. The heated communal pool can be utilized by all guests. It is not available in the winter months. The unit was neat and laid out efficiently, but probably not suited for a family. The loft style of the bedroom is not conducive to families with 2 kids that must share a pull out on the first floor. Electric heating is a nuisance and it seemed very challenging to maintain a consistent and comfortable temperature throughout the unit. Outdoor lights on front door / stairs not working. VERY dangerous on a dark night with slippery conditions on the decking and stairs. Overall good experience, but for the $ I think we could have done better. These units are typically set up to accommodate 6 people. We didn't feel that was appropriate so set ours up for a maximum of 4. I'm sorry you didn't feel it was spacious enough for your occupancy. The accomodations are clearly indicated in the listing. The price is extremely moderate in comparison to the village. I was not aware the exterior light was not working, as it was the last time we were there. I will repair it, but would have appreciated a heads up. I'm glad you enjoyed the condo otherwise.. The condo was absolutely spectacular. Everything that you could ever need is provided for you, and the entire place was immensely clean. The place has a very welcoming and homey vibe, and the scenery behind the deck is stunning would absolutely visit this place again! We really enjoyed our stay at this condo in Blue Mountain. It was clean, and tastefully decorated. It came with everything that we needed. The only mishap that we had was that I found the stairs a bit steep and I fell down the stairs on the first night. Other then that everything was really good. We would definitely book again if the chance ever came up again. The bathrooms were fine as well as the linen and towels. The rest of the appartment was also fine. However, many lightbulbs were not working. The appartment would gain by investing in a mattress in the master bedroom as well as on a new sofa bed. Collingwood and The Blue Mountains is located on Georgian Bay, a beautiful all seasons area full of eco tourism, skiing, golfing, shopping, and culture. There are spectacular views of Lake Huron, with beaches in the summer, and great skiing, and boarding at the biggest ski resort in Ontario in the winter.